115 Beacon is located on the south side of Beacon, between Arlington and Berkeley, with 113 Beacon to the east and 117 Beacon to the west. 115 Beacon was designed by architect Nathaniel J. Bradlee and built ca. 1863, one of two contiguous houses (113-115 Beacon) built for the estate of Mace Tisdale, who had died in November of 1861. Click here for an index to the deeds for 115 Beacon. 113 Beacon became the home of Mace Tisdale’s only surviving child, Frances Ann (Tisdale) Bradlee, widow of John Rice Bradlee. 115 Beacon became the home of her son and daughter-in-law. dry goods merchant John Tisdale Bradlee and Sarah Elizabeth (Goddard) Bradlee. They previously had lived at 28 Edinborough. Although they shared the same surname, it does not appear that the architect, Nathaniel Bradlee, and John Rice Bradlee were closely related. By 1869, 115 Beacon was the home of John Collamore, an importer of crockery. He was a widower and lived at 115 Beacon with his unmarried daughters, Eliza and Helen Collamore. They previously had lived at 1 Ashburton Place. John Collamore died in April of 1884. 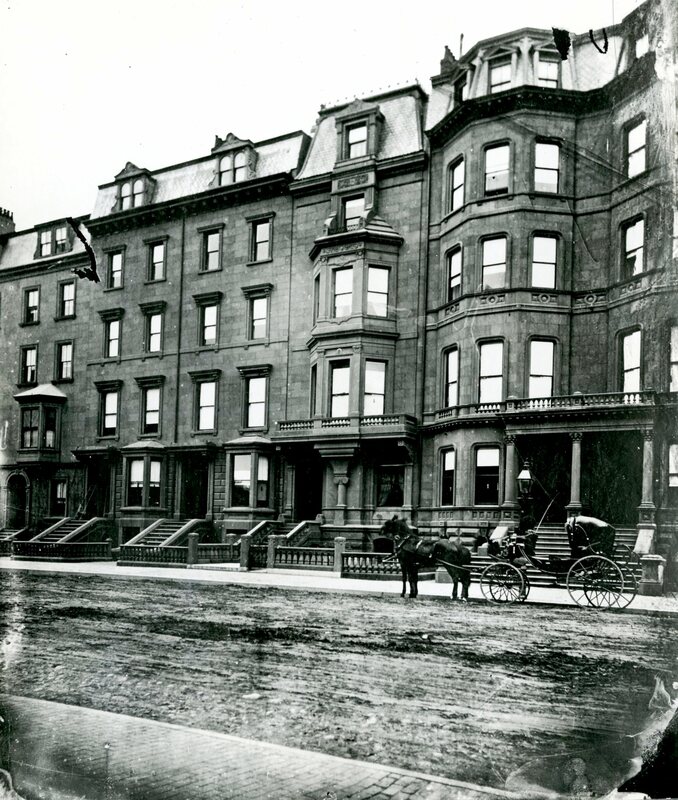 Eliza and Helen Collamore continued to live at 115 Beacon during the 1891-1892 winter season. By 1893, they had purchased and moved to 317 Commonwealth. By the 1892-1893 winter season, 115 Beacon was the home of dry goods and wool merchant Edgar Harding and his wife, Sarah Marston (Robinson) Harding. They previously had lived in Cambridge. They continued to live at 115 Beacon in 1895. 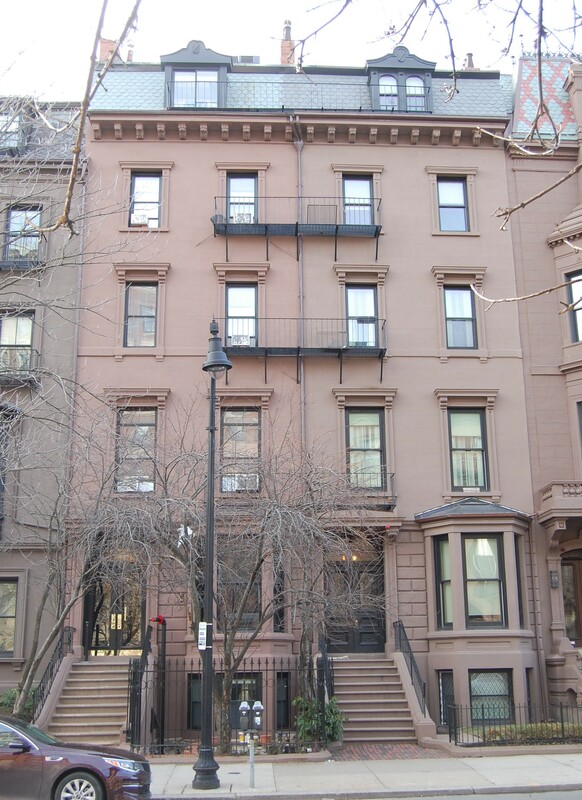 In September of 1895, they purchased and subsequently moved to 324 Beacon. 115 Beacon was not listed in the 1897 and 1898 Blue Books. By the 1898-1899 winter season, it was the home of Rev. John Adams Bellows and his wife, Isabel (Francis) Bellows. He was a Unitarian clergyman and operated a private school in the house. They previously had lived in Portland, Maine, where he had operated a “young ladies boarding and day school” in their home. 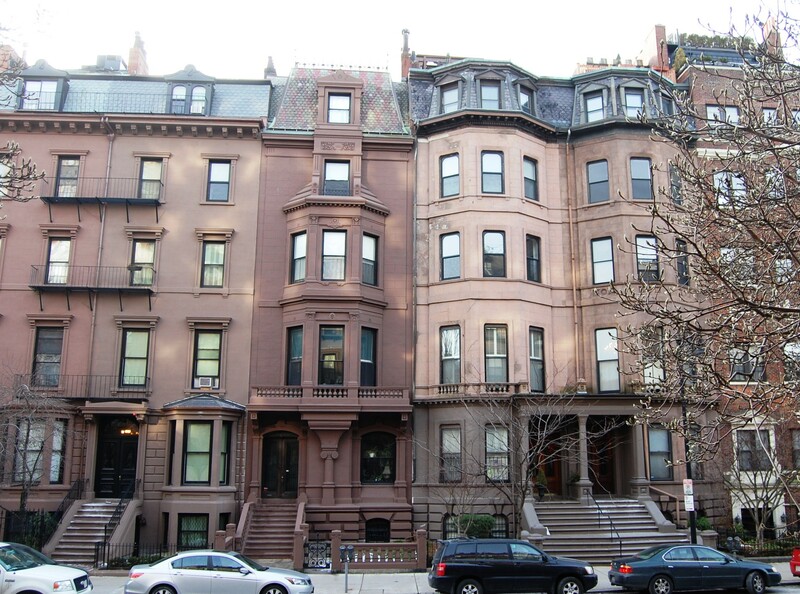 They continued to live at 115 Beacon until about 1910, when they moved to Brookline. By the 1911-1912 winter season, 115 Beacon was the home of Miss Lucretia Stevens Heckscher. She continued to live there until about 1922. The house was not listed in the 1923 Blue Book. John Tisdale Bradlee had died in May of 1908, and Sarah (Goddard) Bradlee had continued to live at 113 Beacon and own 115 Beacon until her death in January of 1923. In October of 1923, their son, John R. Bradlee, leased 115 Beacon to the Erskine School, operated by Miss Euphemia E. McClintock, who lived at 129 Beacon. A native of South Carolina, Euphemia McClintock had served as president of the College for Women in Columbia, South Carolina, until it merged with Chicora College in 1915. She moved to Boston, where her sister, Mary Law McClintock, operated Miss McClintock’s School at 4 Arlington and (by 1922) at 135 Beacon. Euphemia McClintock probably first was a teacher in her sister’s school, but by late 1923 had established her own institution, Erskine School, at 115 Beacon. On December 1, 1923, 115 Beacon was purchased from the Bradlee family by Addie (Ann) M. (Brown) Greenman, the wife of Charles Edward Greenman, a sole leather dealer. They lived in Haverhill. The purchase was subject to the lease with Euphemia McClintock. Mary Law McClintock died in January of 1925, and Euphemia McClintock appears to have inherited her sister’s school. McClintock School soon ceased operation at 4 Arlington and Euphemia McClintock moved her Erskine School from 115 Beacon to 135 Beacon. In 1924, 115 Beacon became the Greenmans’ home. Their adult children, Althine Greenman and Charles Greenman, Jr., a leather dealer in his father’s firm, lived with them. They also maintained a home in Hampton, New Hampshire. By the 1926-1927 winter season, they had been joined by James E. Buttolph, a lodger who also probably was a salesman with Charles Greenman’s firm. Althine Greenman married in October of 1928 to Joseph C. Kennedy, After their marriage, they lived with her parents at 115 Beacon and in Hampton. He was a leather dealer associated with his father-in-law’s firm. Charles Greenman died in September of 1929, and Addie Greenman, Charles Greenman, Jr., and the Kennedys moved soon thereafter. Addie Greenman continued to own 115 Beacon. The house was not listed in the 1931 and 1932 Blue Books, and is shown as vacant in the 1931 and 1932 City Directories. By 1933, Erskine School once again occupied 115 Beacon as a dormitory, leasing the house from Addie Greenman. On November 27, 1938, the basement and a portion of the first floor of 115 Beacon were damaged by fire. The school continued to occupy the property as a dormitory until about 1941. On July 30, 1942, 115 Beacon was acquired from Addie Greenman by Elizabeth Krauss, who lived and operated a lodging house at 141 Beacon. In December of 1942, Elizabeth Krauss applied for (and subsequently received) permission to convert 115 Beacon into a lodging house. At the same time, Max and Emma Feer converted 113 Beacon from a single-family dwelling to a lodging house. Connecting fire balconies were constructed between the two buildings. Elizabeth Krauss operated both 115 and 141 Beacon as lodging houses. She continued to live at 141 Beacon until about 1945, when she moved to 115 Beacon. Her brother-in-law and sister, Francis Ford Flanagan and Catherine (Krauss) Flanagan, owned and operated a lodging house at 139 Beacon. In August of 1944, Elizabeth Krauss and Catherine (Krauss) Flanagan acquired 131 Beacon, which they operated as a lodging house until July of 1959, when they sold it. 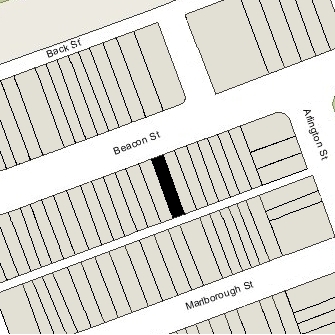 From the mid-1940s through the mid-1950s, Elizabeth Krauss also operated a lodging house at 418 Beacon. She continued to live at 115 Beacon until about 1956, when she moved back to 141 Beacon (which she had purchased in March of 1948). Catherine )Krauss) Flanagan died in February of 1970 and in September of 1972 Elizabeth Krauss acquired 139 Beacon from their sister, Marie (Krauss) Majane, who had inherited it from Catherine Krauss. Elizabeth Krauss continued to operate 115 Beacon, 139 Beacon, and 141 Beacon as lodging houses. On October 30, 1997, 115 Beacon was acquired from the Elizabeth Krauss Charitable Remainder Annuity Trust by Fisher College. At the same time, the college also purchased 139–141 Beacon from another trust established for the benefit of Elizabeth Krauss. Fisher College continued to operate 115 Beacon as a lodging house in 2015.